The Rangers have acquired third baseman Patrick Wisdom from the Cardinals for infielder/outfielder Drew Robinson, according to an announcement from Texas. Additionally, the Rangers have hired former major league right-hander Brandon McCarthy as special assistant to general manager Jon Daniels. Wisdom, 27, was a first-round pick of the Cardinals in 2012, though he didn’t reach the majors until last season. He impressed over a small sample of work, hitting .260/.362/.520 with four home runs in 58 plate appearances. In Texas, the former well-regarded prospect may have an opportunity to receive quite a bit of work at third base, as the club lost Adrian Beltre to retirement and may trade Jurickson Profar this offseason. Playing time would have continued to be hard for Wisdom to come by in St. Louis, which boasts Matt Carpenter as its starting third baseman and has quality depth in the form of Jedd Gyorko (if he’s not dealt), Yairo Munoz and now Robinson. The 26-year-old Robinson will give the Cardinals the lefty-hitting utility player they’d been seeking, having garnered big league experience at second, third, shortstop and all three outfield positions. Robinson hasn’t hit much, however, with a .204/.301/.366 slash and nine HRs in 246 trips to the plate. He did rake at the Triple-A level last season, though. As for McCarthy, he’s shifting to a front office position immediately after the end of his playing career and returning to the Rangers, with whom he pitched from 2007-09. The 35-year-old spent the final season of his career with the Braves, his seventh team in a big league tenure that was productive but marred by injuries. McCarthy was someone who embraced analytics throughout his pitching career, helping make him a logical choice for a front office role in his post-playing days. 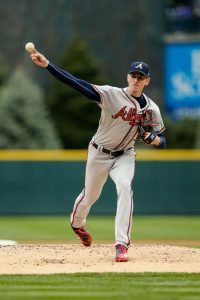 The Braves announced several roster moves Saturday, including the promotion of right-handed pitching prospect Kyle Wright, whom they selected from Triple-A Gwinnett. The club also transferred closer Arodys Vizcaino to the 60-day disabled list and selected outfielder Lane Adams’ contract from Triple-A. Meanwhile, injured righty Brandon McCarthy re-aggravated his right knee during a rehab assignment and did not come off the 60-day DL, Gabe Burns of the Atlanta Journal-Constitution reports. There’s a lot to unpack here, though the most exciting news for Atlanta is the addition of Wright. The ex-Vanderbilt standout entered the 2017 draft as a potential No. 1 pick, but he fell to No. 5, leading the Braves to scoop Wright up and sign him to a then-record bonus worth $7MM. Wright has made good on that pick by emerging as one of the majors’ elite pitching prospects, evidenced in part by MLB.com ranking him as the game’s 24th-best farmhand. The 22-year-old is set to become the latest highly promising Braves hurler to debut in 2018, joining the now-injured Mike Soroka, Touki Toussaint and Kolby Allard. While Wright has a chance to eventually emerge as a high-end starter, he’ll work out of the playoff-contending Braves’ bullpen down the stretch, per Burns. Wright did make three relief appearances out of seven at the Triple-A level this year, but he has primarily served as a starter in 2018. Across 27 appearances and 24 starts between Double-A and Triple-A this season, Wright pitched to a 3.46 ERA with 8.7 K/9 and 3.3 BB/9. Elsewhere in the Braves’ bullpen, Vizcaino’s move to the 60-day DL looks discouraging on the surface, but he’s still likely to make it back in 2018, manager Brian Snitker told Burns and other reporters on Saturday. Vizcaino had been on the 10-day DL since July 14 with right shoulder troubles, so he’s now ineligible to return until mid-September. His absence has paved the way for lefty A.J. Minter to close for the Braves, and the latter has converted 11 of 13 saves while notching a 3.12 ERA with 10.21 K/9 against 2.94 BB/9 in 52 innings this season. While the the latest development regarding Vizcaino isn’t ideal, McCarthy’s setback is downright discouraging, as it’s now possible he has thrown his last major league pitch. McCarthy, who hasn’t taken a major league mound since June 24, announced earlier this month that he plans to retire at the end of the season. The 35-year-old has started in all 15 of his appearances this season, but he was set to finish the year as a reliever upon his return. Adams, whom the Braves signed to a minors pact in mid-July, saw action with them earlier season and last year, totaling 143 plate appearances and batting a respectable .270/.345/.460. The 28-year-old was out of the Atlanta organization for a brief period in 2018, though, as he elected free agency in late April and then latched on with the Cubs. But Adams struggled with Chicago’s top minor league affiliate before rejoining Gwinnett, with which he hit an unappealing .191/.238/.266 with no home runs in 101 PAs this season. Veteran righty Brandon McCarthy says he’ll wrap up his playing career at the end of the season, MLB.com’s Mark Bowman writes. This is his 13th campaign in the majors. McCarthy, 35, is still hoping to make it back from a knee injury that has sidelined him for a major portion of the 2018 campaign. Indeed, he says he’d have undergone season-ending surgery on the joint if he planned to continue pitching into the future. Unsurprisingly, with just six weeks left in the regular season, McCarthy is only considering returning as a reliever. He’s also modifying his delivery in an effort to work through the knee problem. Whether or not it works out, it seems the towering veteran is committed to giving it one final go before finishing out his four-year, $48MM contract and riding off into the sunset. It’s certainly possible McCarthy could be a useful asset for the Atlanta organization down the stretch. With a division title on the line, the club will need every good arm it can muster. And once the calendar flips to September, it won’t have to worry about active roster limitations. It’s easy to look at McCarthy’s 4.92 ERA from 78 2/3 innings this year and question whether he has much left. But that only tells part of the story. After opening the year with a significant velocity loss, the speed readings ticked northward. McCarthy has generated a sturdy 48.0% groundball rate with 7.4 K/9 and 2.4 BB/9. He has surely been at least somewhat unlucky to surrender a .332 BABIP and 21.7% HR/FB rate (more than double his career level); indeed, both xFIP (3.75) and SIERA (4.09) viewed him as a still-productive hurler. In any event, it remains to be seen whether McCarthy can come back from injury one final time. Doing so has, unfortunately, been a significant aspect of his career. The former 17th-rounder has only once taken the ball for all 32 starts in a season, in a 2014 campaign in which he recorded exactly two hundred frames. That’s just one of five years in which he reached triple-digit innings tallies. As things stand, McCarthy owns a 4.20 ERA with 6.7 K/9 and 2.4 BB/9 through 1,223 2/3 lifetime MLB innings. Between his debut with the White Sox in 2005 and his current run in Atlanta, he has seen action with the Dodgers, Rangers, Diamondbacks, Athletics, and Yankees, never stopping in one place for more than three seasons. No matter how things finish out for McCarthy late this season, he’ll wrap up a productive career as a highly respected veteran. Given his well-earned reputation for wit and wisdom, McCarthy seems sure to make a mark in the game — or some other arena — in the future. In a recent podcast with Jeff Passan of Yahoo Sports, Indians right-hander Trevor Bauer suggested he’d only take one-year deals for the remainder of his career (partially due to the high stakes of a bet with a childhood friend). Although that seems radical and somewhat irresponsible on the surface, Eno Sarris dives into the subject in a piece for The Athletic and discovers that maybe the idea isn’t really all that bad. Although Bauer would be giving up a lot of security, he’d likely earn a significant bump in average annual value. Bauer has never had health issues, so in his case the health risks might not be as severe as other players seeking long-term deals to lock up the most total dollars possible. All in all, Sarris comes to the conclusion that the contract strategy could feasibly benefit Bauer in the long run. The Twins placed righty Aaron Slegers on the disabled list today with shoulder inflammation, and plan to recall rookie Fernando Romero to make a start in his stead. Slegers had a rough go of it in three appearances (two starts) this season, allowing eight earned runs in 12 2/3 innings with just five strikeouts. Romero, on the other hand, has made ten starts this season and turned in a reasonable performance thus far ( 4.38 ERA). Braves right-hander Brandon McCarthy is rehabbing his knee injury, David O’Brien of the Atlanta Journal-Constitution reports, but oddly enough he’s doing it at his home in Arizona with his own physical therapist. Obviously that’s far from the norm at this point in the season, particularly given Atlanta’s status as a contending team in the NL East. McCarthy came to Atlanta in a financially-motivated trade with the Dodgers, but has barely managed to exceed five innings per start in his tenure with the Braves thus far, and has posted an ugly 4.92 ERA. Another Rangers prospect has gone down with the dreaded ulnar collateral ligament injury, and will require Tommy John surgery, Evan Grant of the Dallas Morning News reports. This time, it’s right-hander Kyle Cody, who had been attempting rest and rehab as an alternative to surgery. Cody was shut down for an extended period after experiencing issues during spring training; he’ll now go under the knife and likely be out until the beginning of 2020. The towering 6’7″ hurler was a sixth-round pick of the Rangers back in 2016. The Braves announced Thursday that they’ve activated Ronald Acuna Jr. from the disabled list and placed veteran right-hander Brandon McCarthy on the 10-day DL due to tendinitis in his right knee. Atlanta also optioned righty Wes Parsons back to Triple-A Gwinnett just a day after he had his contract selected and recalled righty Matt Wisler from Gwinnett. Acuna, 20, has been out since May 28 due to a knee contusion and a mild sprain of his left ACL, but he figures to return to an everyday role in left field, joining Ender Inciarte and Nick Markakis in a productive Braves outfield. The game’s consensus top prospect to open the season, Acuna did nothing to suggest he wasn’t deserving of such high praise in his first taste of the Majors, hitting .265/.326/.453 with five homers and seven doubles through 129 plate appearances in spite of his youth. McCarthy, soon to be 35, has had his share of struggles in Atlanta this year, compiling a 4.92 ERA with 7.4 K/9, 2.4 BB/9, 1.72 HR/9 and a 48 percent ground-ball rate. To McCarthy’s credit, most of the damage done against him came in a pair of brutal starts at the beginning of May, when he yielded 14 runs over a combined 8 1/3 innings. The righty pitched quite well in the month of April and, since that ugly pair of consecutive outings in May, has worked to a respectable 4.23 ERA with a pristine 35-to-6 K/BB ratio in 38 1/3 frames. With McCarthy going on the shelf and Mike Soroka now out until at least late August, the Braves’ rotation consists of Sean Newcomb, Mike Foltynewicz, Julio Teheran and Anibal Sanchez. Wisler, Max Fried, Luiz Gohara and Lucas Sims are among the options already on the 40-man roster that could step up and make some starts in lieu of McCarthy. At 45-34, the Braves still hold the the lead of the NL East by two and a half games despite the fact that their play has slipped a bit as of late. Atlanta has played at a .500 clip this month and is 5-5 over its past 10 games, but neither the Nationals nor the Phillies have made up any substantial ground in the division during that time. The Dodgers and Braves swung an out-of-nowhere, payroll-geared trade Saturday consisting of five major leaguers, with just one (Matt Kemp) going to Los Angeles in exchange for Adrian Gonzalez, Scott Kazmir, Brandon McCarthy and Charlie Culberson. LA, which made the trade for luxury tax purposes, previously tried to send Gonzalez, Kazmir and McCarthy to the Marlins as part of a package for now-Yankee Giancarlo Stanton, according to Andy McCullough of the Los Angeles Times. Although that failed, Dodgers brass already had a fallback option in the Braves, whose general manager – Alex Anthopoulos – worked in LA’s front office until mid-November. The two sides began discussing the parameters of Saturday’s trade shortly after his hiring, per McCullough. Talks gained steam during this week’s Winter Meetings before culminating in an agreement Saturday. The Padres will consider a reunion with Gonzalez if they’re unable to reel in free agent first baseman Eric Hosmer, Bob Nightengale of USA Today suggests (Twitter link). Gonzalez was a franchise player in San Diego from 2006-10, slashing .288/.374/.514 with 161 home runs in 3,425 plate appearances and earning three All-Star nods. Having completed this trade, it seems the Braves’ heavy lifting for the offseason is mostly over, as David O’Brien of the Atlanta Journal-Constitution details. They improved their defense by getting rid of Kemp, thus freeing up a spot in the outfield for elite prospect Ronald Acuna (he’ll be in the majors early in 2018, whether it’s Opening Day or a bit later); added a veteran starter in McCarthy (possibly two if Kazmir recovers from a hip injury); and landed a backup infielder they like in Culberson. While Anthopoulos said the Braves could still seek a third baseman and relief help, he noted that those areas are not priorities, O’Brien writes. Meanwhile, Nightengale, Jeff Sullivan of FanGraphs and Bill Shaikin of the LA Times agree that this trade will help set up an action-packed offseason in a year. Now that the Dodgers are unlikely to exceed the $197MM luxury tax threshold in 2018, they can be more aggressive in trying to reel in certain members of a star-studded class of free agents next winter. One of their own standouts, left-hander Clayton Kershaw, could be a prominent part of that group. In a stunning swap of big contracts, the Dodgers have traded first baseman Adrian Gonzalez, left-hander Scott Kazmir, right-hander Brandon McCarthy and infielder Charlie Culberson to the Braves in exchange for outfielder Matt Kemp. The Braves will also receive $4.5MM in cash. Ken Rosenthal of The Athletic was the first to report news of the trade. Furthermore, Mark Bowman of MLB.com adds that the Braves have already designated Gonzalez for assignment. A source close to Rosenthal tells him that the Dodgers are likely to trade or release Kemp (Twitter link). There’s a ton to unpack here, but the biggest motivator of the trade appears to be money, and more specifically luxury tax implications for the Dodgers. Rosenthal notes in another tweet that the trade is “effectively cash-neutral overall,” but adds that the swap will put the Dodgers below the $197MM luxury tax threshold for the 2018 season. That will allow the Dodgers to reset the escalating luxury tax penalties, which seems to have been a significant objective for the club this offseason. The money owed to Kemp is spread out across the 2018-2019 seasons, while Gonzalez, Kazmir and McCarthy all have just one year remaining on their contracts. Rosenthal offers further clarification yet, as he points out that the Dodgers have paid the luxury tax for five consecutive seasons. Their penalty for 2017 was over $30MM, but if they keep their payroll below $197MM, their penalty will drop from 50% on the overage to 20% the next time they exceed the luxury tax threshold. Joel Sherman reports in his own tweet that the Braves are planning to release Gonzalez, but can’t do so until Monday since MLB teams can’t release players on weekends during the offseason. Gonzalez actually had to waive his no-trade clause in order to make this trade possible, and Bob Nightengale of USA Today Sports reports that he did so mainly because the Dodgers told him he’d be buried on the bench and receive limited at-bats. As for the Braves, the $4.5MM they’ll get in the deal will even out the overall dollars swapped in the trade (hat tip to Jon Heyman of FanRag Sports). GM Alex Anthopoulos says that McCarthy satisfies the team’s “desire to add a veteran starter,” while Culberson fills their need for a bench player (via Mark Bowman of MLB.com). Kazmir has some upside as a rotation piece too. Not insignificant is the fact that the Dodgers have opened up multiple spots on their 40-man roster, including one that was already earmarked for Tom Koehler, with whom the Dodgers have recently agreed to a one-year deal. 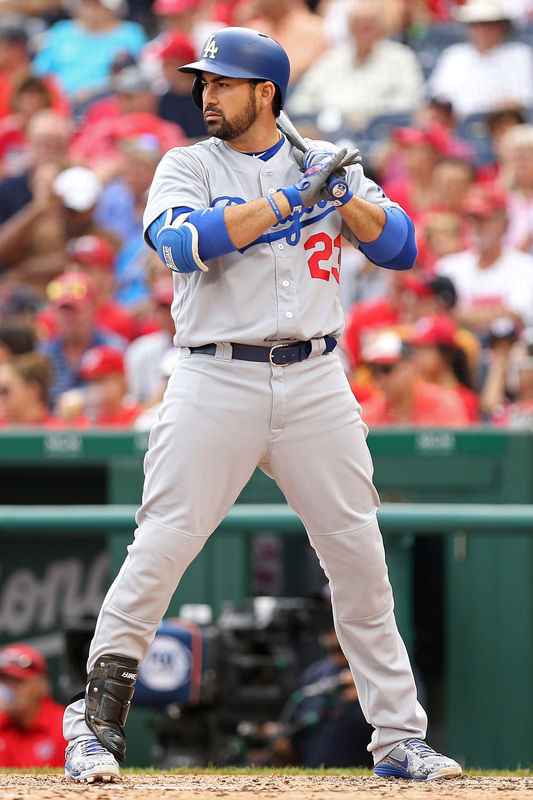 Kemp, 33, was a sixth-round selection of the Dodgers back in 2003. He made his major league debut in 2007, and went on to have some great seasons for Los Angeles, including a 2011 campaign in which he finished as the runner-up in the MVP voting. Later that year, the club signed the outfielder to an eight-year, $160MM extension. 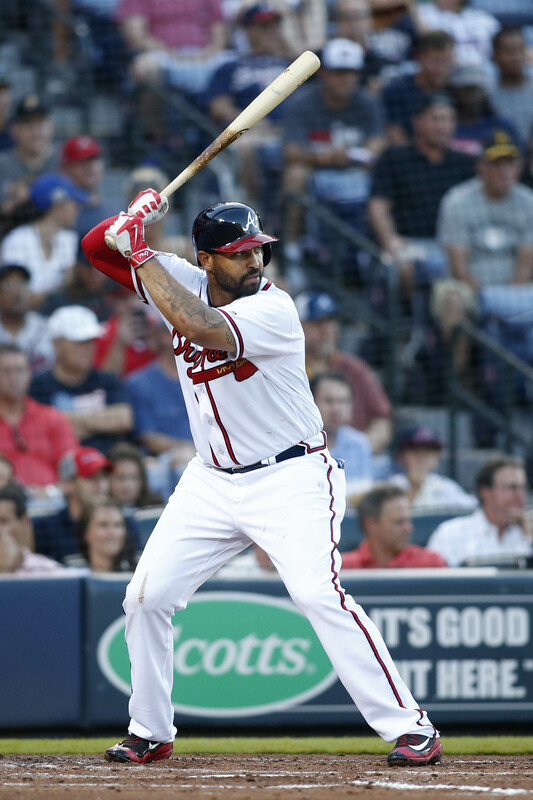 Not long after that, his performance began to decline; Kemp has only topped 1 WAR once in the past four seasons as his contract has been tossed between the Padres, Braves and Dodgers. For the 2017 season, Kemp hit .276/.318/.463, making him a roughly average major league hitter (100 wRC+). However, his poor defense in the outfield dropped his overall value to -0.5 fWAR. Gonzalez, now 35 years of age, went to the Marlins with the number one overall pick in the 2000 draft. His breakout season came with the Padres in 2006; that year began a streak of ten consecutive seasons wherein the left-handed-hitting first baseman posted at least 2.9 fWAR. Across those years, he posted a .292/.366/.501 slash line and mashed 283 homers. This past season, however, Gonzalez battled injuries throughout the year and didn’t hit well when healthy; he amassed only 252 plate appearances across 71 games with the Dodgers and managed a career-worst .355 slugging percentage. All told, Gonzalez was valued at 1.1 wins below replacement level. Kazmir’s story is a roller coaster of sorts; he was a great pitcher during his early years with the then-Devil Rays, including a 2007 season in which he posted a 3.48 ERA with 239 strikeouts across 206 2/3 innings. However, Kazmir began to struggle with injuries and ineffectiveness in 2009, and though he experienced a resurgence in July that prompted a trade to the Angels, his ERA during the 2009 postseason was an ugly 7.59. Those struggles continued into the 2010 season, and by 2011 Kazmir was pitching for the Angels’ Triple-A affiliate and was cut before June was over. After spending 2012 out of MLB entirely, the Indians took a chance on him in 2013, and he rewarded them with a 4.04 ERA (and 3.51 FIP) campaign that earned him the Comeback Player of the Year Award. He signed a two-year deal with the Athletics the following offseason, and seemed to be “back.” The Dodgers signed Kazmir to a three-year, $48MM deal, but the injury bug struck once again, marring his 2016 performance and keeping him off the field entirely in 2017. The 34-year-old McCarthy has a career 4.15 ERA across 1,145 big league innings with the White Sox, Rangers, Athletics, Diamondbacks, Yankees and Dodgers. He’s generally provided value while on the field, but has only topped 140 innings twice in his twelve-year career. Part of that can be attributed to injuries, including a 2015 Tommy John surgery when he famously noted on Twitter that “31 years is a lot to ask for from a ligament.” During the past two seasons, he’s put up a 4.27 ERA while striking out 116 batters in 132 2/3 innings. Based on his age and team control, the soon-to-be 29-year-old Culberson is the one player in this deal who looks capable of being a long-term piece. The Georgia native won’t even be eligible for arbitration until next winter, meaning the Braves could control him for the next four seasons. The righty-hitting Culberson hasn’t found much big league success since debuting in 2012, though, having hit just .229/.269/.321 in 443 PAs with three NL West clubs – the Giants, Rockies and Dodgers. Culberson racked up a mere 83 trips to the plate in two seasons with the Dodgers, but he did swat a couple dramatic homers during his LA tenure. The Brewers’ rebuilding efforts have worked more quickly than most outside experts predicted, and GM David Stearns credits the team’s resilience, Tom Haudricourt of the Milwaukee Journal Sentinel writes. “Really, last year, while we maybe had a month or two that was disappointing, we never went on those prolonged losing streaks,” says Stearns. “That speaks to what has been a theme of this year – the resilience of this team. We talk about that a lot. A lot of the credit for that goes to the character of our players, and the culture and energy that Craig (Counsell) and his staff have instilled, going back to Spring Training of last year.” Of course, as Haudricourt notes, the Brewers’ success this year does not guarantee they won’t take a step backward in 2018. Stearns, though, has been careful to avoid specific season wins goals, either on the low end or the high end, and focus instead on assembling a talented group of players who can be competitive for the next several seasons. Here’s more from the NL. The Phillies have struggled this season, but GM Matt Klentak still seems to have manager Pete Mackanin’s back, as MLB.com’s Todd Zolecki writes. The Phillies extended Mackanin through 2018, with an option for 2019, in May. “When we signed him to the extension, the intention was to take the drama out of both this year and next year,” says Klentak. “Beyond that we’ll have to see, but I think when we signed Pete, that was right in the beginning stages of our struggles. The fact that he and his staff were able to weather the storm and get us going on the right track was really important for us this season.” The Phillies are 57-90, but it seems Mackanin will return next season. Dodgers manager Dave Roberts says righty Brandon McCarthy will rejoin the club next weekend, MLB.com’s Ken Gurnick writes. McCarthy has been out since late July with a blister issue. There won’t be space for McCarthy in the Dodgers’ crowded rotation (although Roberts isn’t ruling out the possibility McCarthy could start at some point), but there will in its crowded clubhouse — McCarthy will likely become the 40th active player on the Dodgers’ roster, and will pitch in relief. McCarthy has struggled to stay healthy this season, but has generally been effective when available, posting a 3.84 ERA, 6.9 K/9 and 2.6 BB/9 in 86 2/3 innings spanning 16 starts. The Dodgers have selected the contract of infielder Charlie Culberson, per a club announcement and as J.P. Hoornstra of the Southern California News Group first reported on Twitter. Veteran righty Brandon McCarthy was placed on the 60-day DL to create roster space, though he’s still progressing through a rehab assignment and could also rejoin the active roster later this month. Culberson, 28, hasn’t seen the majors yet this year but has appeared in 182 total MLB games over parts of four seasons, including a brief stint with the Dodgers last year. (Indeed, Culberson made the roster for the NLDS.) At Triple-A, he carries a .250/.299/.336 slash over 414 plate appearances. Los Angeles is in need of some shortstop depth while the team lets Corey Seager rest his balky elbow.